Home→African American→VIDEO: What Are the Best Hair Loss Treatments for Men + Women? 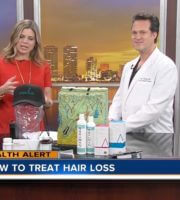 What Are the Best Hair Loss Treatments for Men and Women? Did you know you can lose 50% of your hair without knowing it? “Invisible Baldness” means if you’ve lost 50% or less of your hair, it can look EXACTLY the same. However, if you lose just a bit more, you could see scalp shining through. HairCheck – HairCheck is a non-invasive painless way to assists in measuring the amount of hair loss you have experienced and tracks hair regrowth over time so you can know what treatment is working, how much, and where. HairCam – Did you lose hair density, hair diameter or both? HairCam shows you exactly the quantity and quality of hair in an area of the scalp using high-powered (60-80x) dual-polarized LED magnification. 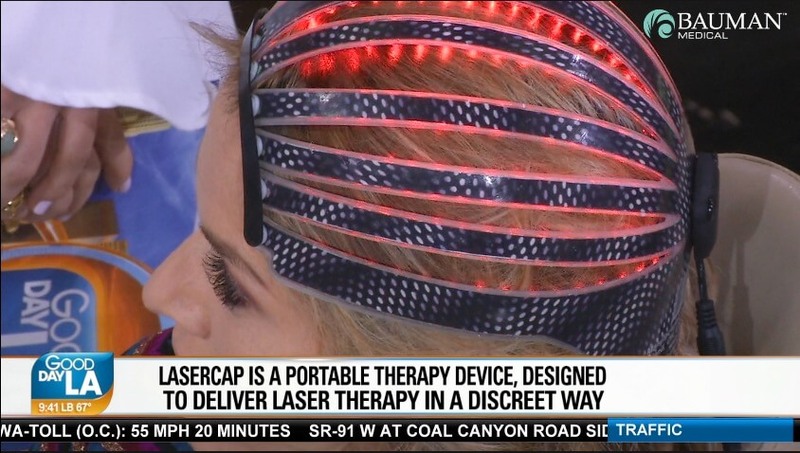 Bluetooth LaserCap MC2 – Did you forget your laser treatment today? Coming soon! NEW “HairCoach” smartphone app reminds you and tracks your at-home laser (and other) treatments so both you and your doctor can track your compliance. Available in 2019! 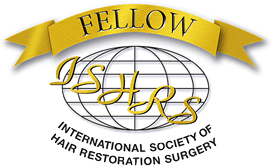 An FUE or Follicular Unit Extraction hair transplantation procedure harvests hair follicles without removing a strip of scalp, leaves no linear scar, and has a shorter less-restricted downtime. 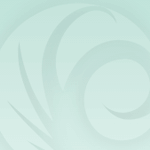 FUE can be used to restore a hairline, crown, temples, beard, and more in both men and women. No-shave techniques are available so your procedure can be a secret. ARTAS Robotic-Assisted FUE – Artificial Intelligence helps the surgeon remove individual FUE grafts from the scalp without a scalpel or stitches. 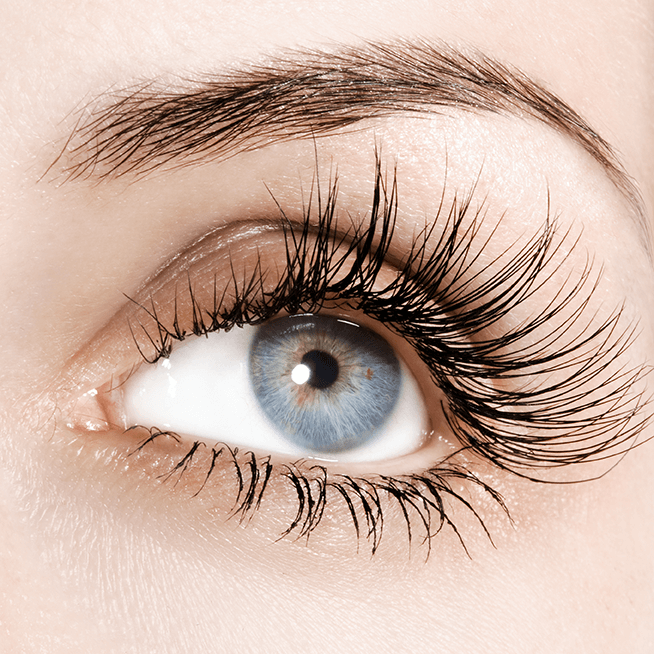 Eyebrow & Eyelash Transplants – hair follicles from the scalp can be used to restore weak or missing eyebrows or eyelashes (the procedure “comes with scissors” because you have to trim the implanted lashes or brows at least twice a month). 00:02 Vanessa Borges: Everyone thinks of hair loss as a male problem, but the ladies out there can suffer from thinning hair as well. The secret is do something before you actually go bald. We’ll explain and reveal, coming up next. 00:14 VB: Welcome back, everybody. Big subject this morning. Hair loss can be frustrating, surprising, and downright embarrassing, but the fact is 80 million Americans are losing their hair. Today, we’re gonna show you how to keep the hair you have and how to restore the hair you’ve lost. That’s the big part of it. Dr Alan Bauman is here. He is a hair restoration physician and he’s brought a few tools with him today, and we have a lovely model, as well, who’s helping us out, our lovely Megan Colarossi. 00:41 Megan Colarossi: I’m like your typical patient. I’m just on my phone. 00:44 VB: Right. Exactly, not paying attention. 00:45 Dr Alan Bauman: Right. But we did talk about her hair loss a little bit before we got started. 00:48 DB: We did some measurements and what we saw is that there is some thinning right here in the area. We’re gonna take that final measurement right now, in this area right here, there was some thinning. We took a measurement in the back of the scalp. Hair loss is a big problem, both men and women, whether you’re on come or not. Hair loss can be a significantly bad situation. 01:07 VB: What are you doing to it right now? 01:21 VB: 50%, doctor? ! 01:22 DB: Yeah. You are about 90 in the back and then about 40s up in the front, so that’s not so good. What we’re gonna use is a microscope now to take a look. 01:29 VB: And do you have hair loss in your family, Megan? 01:30 MC: I do. 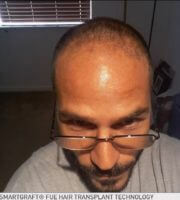 I said on my dad’s side, thinning here, but bald grandfather. Yes. 01:38 MC: But you don’t think about it as a woman. Yeah. 01:40 DB: When we’re looking right at the scalp, this is what we’re seeing right here. You can take a look. Look at the thinning zone right here. 01:46 DB: Weaker, wispier, miniaturized hair for sure. 01:47 VB: You don’t have hair there, Megan. 01:49 DB: But the good news is that we can do something about it. 01:52 VB: There you go. And we have a couple of solutions. 01:54 VB: This is one of them, right? The cap? 01:56 DB: Absolutely. The laser devices that we have now are non-chemical, non-invasive treatment regimens that you can do at home six minutes and automatically, you’re gonna get some treatment at home, non drug, non chemical therapy. 02:08 VB: Ooh, so you’re gonna… That’s what Megan would look like, essentially all lit up in that? 02:11 DB: Yeah. Actually, we’re gonna let her use it. 02:12 MC: We’re gonna put it on me. 02:13 DB: It’s non-chemical, non-invasive, no side effects, doesn’t hurt. And this you can use at six minutes a day at home. Here, you just hold on to that. 02:20 VB: You look fabulous. 02:20 DB: You can do it while you’re doing your workout, like I saw you a couple of minutes ago. 02:24 MC: I just sit here for six minutes? 02:25 DB: Yeah. And the good news is that we can now also track your compliance with this Bluetooth-enabled app. 02:30 VB: And how much does this cost to do? 02:32 DB: Well, this is an at-home treatment. The lasers range from about $3,000-$6,000 now, for at-home with this kind of functionality. 02:39 DB: This is a medical grade laser. This is not the one you’re gonna see in SkyMall Magazine. 02:43 DB: No more combs, no more brushes. 02:44 VB: And we have some before and after pictures of it, right? Of using this cap? 02:47 DB: For sure. Yeah. 02:48 VB: We can show those. 02:48 DB: Look at how many treatments you did already. Great job. You’re on track to regrowing your hair. 02:52 VB: Wow! Wow, look at that before and after. 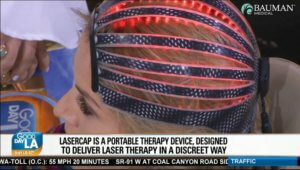 And that is just with using this laser cap ’cause it stimulates the hair growth? 02:56 DB: Correct. Laser light will work on the existing hair that you have, much like chemical treatments, like pharmaceutical interventions that you can get prescribed by a physician. 03:05 VB: Okay. And then we also have another solution as well. 03:07 DB: Right. If the follicles are dead and gone, Vanessa, then you gotta get a little bit more invasive. 03:12 DB: But the good news is that this is not your father’s hair transplant. For men and for women, we can take each individual follicle one at a time, and so that’s what the SmartGraft enables us to do. It’s the iPhone of hair transplant surgery. 03:24 DB: Yeah. You’re ready to go. Yeah. 03:26 VB: Goes into Megan’s head. 03:26 MC: [03:26] ____ Vanessa. 03:27 VB: All right, all right, I won’t. 03:33 VB: And then move them to the front? 03:33 DB: Then implant them into the front. 03:35 VB: Gotcha. Okay. And that’s what, essentially, Megan will need just on the little patch that she had that was thinning? 03:40 VB: And so a lot of women… Did you have hair loss when you, after you had your kids? 03:43 MC: I had a lot of hair loss, after I had kids, falling out in the shower, clumps. And that’s obviously hormonal and stuff like that. 03:50 VB: Right. Is this is a good thing for moms? 03:53 MC: And people’s hair is different after they give birth, too. 03:55 MC: I have friends who have very, very, very thin hair and you get little baby wispies, we call them. 04:00 MC: ‘Cause it’s trying to grow back. 04:01 DB: A lot of thinning can happen due to genetics. Also, other factors like stress, lifestyle, weight loss, medications. There’s a lot of things that can affect your hair. 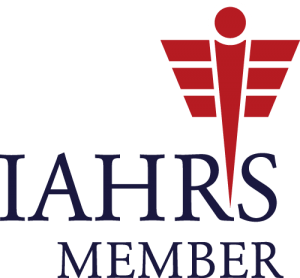 That’s why you need a board certified hair restoration physician, someone who specializes exclusively in hair loss. 04:16 VB: You said that’s from three to about 6,000. How much would this guy cost somebody to do? 04:25 DB: But it’s permanent. 04:27 DB: Permanent and is forever. 04:27 VB: And it is permanent. All right. And then you can also do transplants on beards for men, as well, eyelashes. I mean, I have eyelash extensions. That’s where I get my implants in. 04:37 VB: And eyebrows, too. 04:46 VB: And beards, as well, for those patchy beards. 04:48 DB: Beards, patchy beards, goatees, and all of that. 04:49 VB: Well, thank you to our model, and thank you, Doctor. 04:51 DB: It’s my pleasure. 04:52 MC: I’ve unveiled my dirty little secret. 04:53 VB: I know. That’s your dirty little secret. She has a lot more, though. 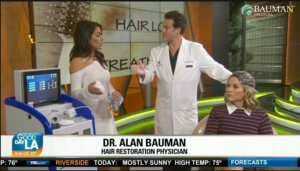 For more on hair loss and Dr Bauman, head over FOXLA.com. We’ll be right back. 05:00 MC: Thank you so much. 05:18 DB: Hey there. 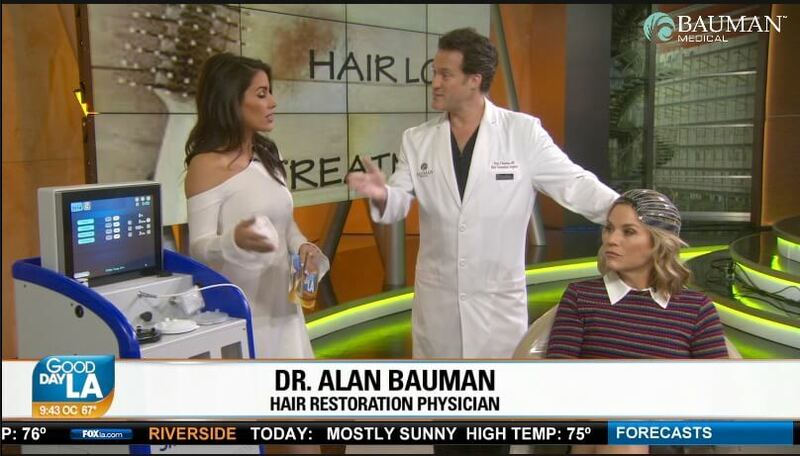 It’s Dr Alan Bauman. 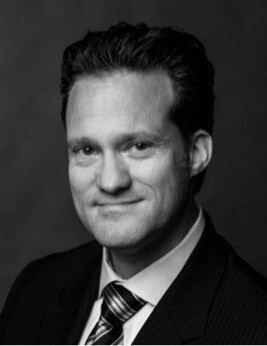 Don’t forget, you can start your hair loss consultation from anywhere in the world by visiting BaumanMedical.com.